Boho Binder/Calendar Set! Welcome Summer!! - The Resourceful Room! Summer Vacation has gotten off to a great start here! I have completed my first updated Binder/Calendar set for next School year! It's a little peak into the room transformation I am planning, it started with Carson Dellosa's Boho Birds set, which inspired a whole new look for me! 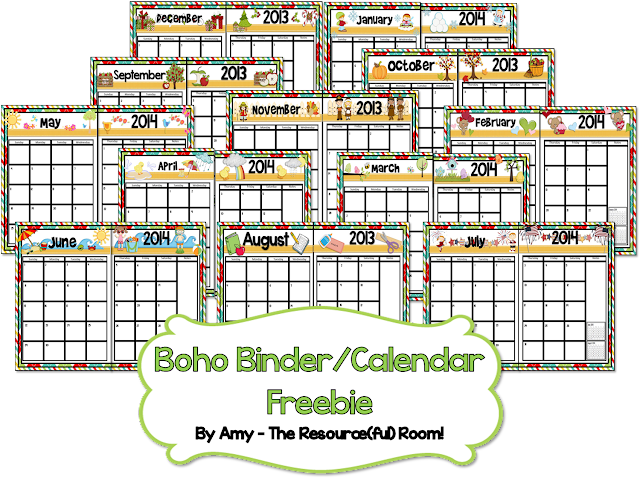 So here it is the Boho Binder/Calendar! The Cover and dividers are already labeled and ready to print. You can choose from one page or two page calendars, both are in this file. If you want a set that you can customize to meet your needs, please visit my TPT store where you can purchase it for on $2.50, and add any text you want!! Add your name to the cover, type in events on the calendar, and create the prefect dividers for your needs. Oh, these are so fun! How do you recommend putting the tabs on the dividers? Diane, I use double stick tape to attached them to the back of the binder dividers so they stick out about half way. How cute? I'm loving the new colors. Thanks so much for this! I just found out for sure which age I will be teaching in the fall, so I am anxious to start doing a little organizing. I just noticed the months have the choice for a one page or two page spread. That will be awesome for me! Thank you so much! I am using 1 of your sets this year. This is a phenomenal freebie - I can tell a lot of love went into this! Where did the tree clipart come from? Drool! Amy-this is so cute! Thanks for sharing your file. I will *have* to check out your other materials that go with it! I love your blog too! I will be checking back to see if you add anything else with the boho birds on it!! Cute stuff!! I loved my calendar set from last year. I am so excited that you are making them again this year! Thank you, Thank You! I just love your freebies. Thank you SO VERY MUCH! I will be using one of them for my professional binders this year. Thanks. Thanks for the binders. Love the Boho birds. Can you tell me where did you purchase the boho birds clip art? I searched the sites you listed in the file but couldn't find them. Please help. I loved this binder set last year! Are you planning on updating it for the 14-15 school year? It has been updated in my TPT store, unfortunately I don't have time to make a set for the blog this year.